The final indication is for patients aged ≥50 years, to help immunize them against pneumonia and invasive infections9; this indication is the one most likely to be seen in the community setting. Oftentimes in the community setting, pharmacists have to administer multiple vaccines to an individual during a single visit. Doing this ensures that the patient receives the appropriate vaccinations needed for that year, and also saves the patient from making an additional trip. The Infectious Diseases Society of America and American Thoracic Society’s consensus guidelines on the management of community-acquired pneumonia in adults recommend that patients keep up-to-date with their pneumococcal vaccines, in addition to their yearly influenza vaccines.3 This means that a community pharmacist may need to administer multiple vaccines, especially for someone who is not up-to-date with their vaccinations. Similar to knowing drug–drug interactions, it is also important to know about any potential interactions between vaccines. PCV13, for example, is contraindicated in patients with an allergy to any of its components, or a prior allergic reaction to a diphtheria-toxoid–containing vaccine.9 In addition, PCV13 has decreased response in adults when given with the trivalent influenza vaccine, and both vaccines should therefore be separated by 4 weeks.9 Because PPSV23 has a decreased response when given with the herpes zoster vaccine, administration of these 2 vaccines should be separated by 4 weeks.7 These interactions should be taken into consideration when evaluating a patient for potential vaccinations. Pneumococcal infections can present as a multitude of disease states, including bacteremia, and—more commonly—pneumonia. Patients aged ≥65 years are at an increased risk, as are those patients with immunocompromised states. For these patients, proactive prophylaxis is more beneficial than treating them after the disease occurs. Currently, PCV13 and PPSV23 are the recommended vaccines to be given to these at-risk patients. Community pharmacies are able to target these patients and potentially help them with immunizations to decrease their risks for developing a pneumococcal infection. Lynch JP 3rd, Zhanel GG. Streptococcus pneumoniae: epidemiology and risk factors, evolution of antimicrobial resistance, and impact of vaccines. Curr Opin Pulm Med. 2010;16:217-225. Assaad U, El-Masri I, Porhomayon J, El-Solh AA. Pneumonia immunization in older adults: review of vaccine effectiveness and strategies. Clin Interv Aging. 2012;7:453-461. Mandell LA, Wunderink RG, Anzueto A, et al. Infectious Diseases Society of America/American Thoracic Society consensus guidelines on the management of community-acquired pneumonia in adults. Clin Infect Dis. 2007;44(Suppl 2):S27-S72. Kobayashi M, Bennett NM, Gierke R, et al. 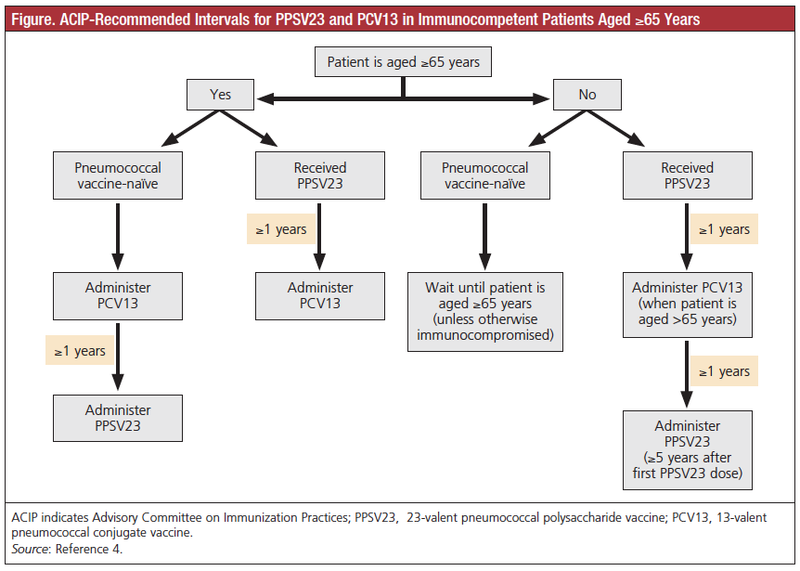 Intervals between PCV13 and PPSV23 vaccines: recommendations of the Advisory Committee on Immunization Practices (ACIP). MMWR Morb Mortal Wkly Rep. 2015;64:944-947. Centers for Disease Control and Prevention. Use of 13-valent pneumococcal conjugate vaccine and 23-valent pneumococcal polysaccharide vaccine for adults with immunocompromising conditions: recommendations of the Advisory Committee on Immunization Practices (ACIP). MMWR Morb Mortal Wkly Rep. 2012;61:816-819. Bonten MJ, Huijts SM, Bolkenbaas M, et al. Polysaccharide conjugate vaccine against pneumococcal pneumonia in adults. N Engl J Med. 2015;372:1114-1125. Pneumovax 23 [package insert]. Whitehouse Station, NJ: Merck and Co, Inc; 2015. US Food and Drug Administration. FDA expands use of Prevnar 13 vaccine for people ages 50 and older. www.fda.gov/newsevents/newsroom/pressannouncements/ucm285431.htm. Published December 30, 2011. Accessed November 25, 2015. Prevnar 13 [package insert]. New York, NY: Pfizer Inc; 2015.